The emphasis in a professional programme is on the development of an analytical mental process through self-learning, facilitated by subject and industry experts. The faculty members use a blend of pedagogic approaches to ensure the internalization of knowledge rather than its mere acquisition. A well balanced weightage is assigned to classroom interaction, experiential learning, co-curricular activities and extra-curricular events for the development of the right attitude, skills and knowledge. Regular Lectures, Tutorials and Seminars for building conceptual foundations. Case Studies, Management Games, Role plays, PowerPoint presentations, Assignments and practical projects to create interactive learning classrooms. Co-curricular activities like debates, extempore, academic contests, quizzes, management simulations, etc. Compulsory value added courses on communication, self development, IT skills, etc. 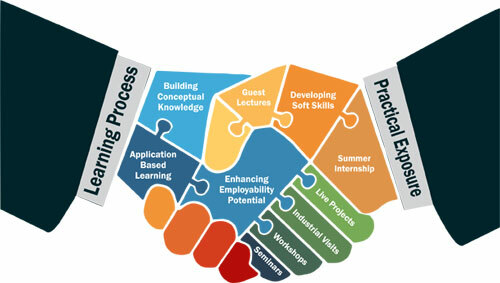 Improvement of employability quotient through a continuous and dedicated student development programme.